Mobile Foundation on IBM Cloud offers a rich set of backend capabilities for building, managing, and updating your next-gen cognitive, engaging, secure, and personalized mobile and web applications. Developers can build applications with the frontend tools and frameworks of their choice and easily add push notifications, analytics, authentication, offline sync, and business logic to their applications. The service allows you to focus on the frontend of the app and leverage the rich backend capabilities out of the box, reducing the app development effort and time to market significantly. Enterprises running production applications have three to four environments (dev, staging, pre-production, and production) on Cloud. 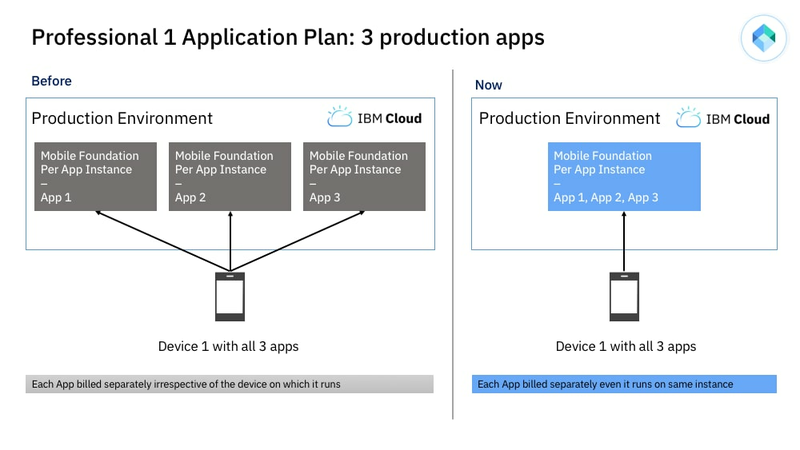 Mobile Foundation had a restriction of one application per service instance, meaning that clients would need three to four instances for each application. Clients with four apps would require 12-16 instances, resulting in complex topology which is difficult to manage. They would also need adapters and other common code needs to be copied across instances. This complexity is multiplied if HA-DR setup is desired. For the Professional Per Device plan of Mobile Foundation, the charges are based on the number of client devices connecting to the server on a daily basis. Since these charges occur per instance, an app per instance would result in increased cost even if all the apps are intended for the same set of client devices. We heard you! To reduce complexity and cost (for the Professional Per Device plan) we are now lifting the restriction of one app per instance for both Professional Per Device and Professional 1 Application plan for Mobile Foundation. Remaining terms and conditions remain the same. Please refer to the new plan descriptions. Consider sizing the liberty for Java nodes appropriately based on the expected load. You can refer to the sizing guidance for help. With the Professional Per Device plan, you can include up to five apps in a single instance and the charges will be based on the client devices connecting on a daily basis, irrespective of the app that the client connects from. Consider the below case of three apps in a production environment intended for the same set of client devices. Along with simplified deployment, the client is billed on connecting to the server only once, irrespective of the app it uses. With the Professional Per App plan, although you can have multiple apps, each app will be charged separately. Consider the below case of three apps in a production environment. Each app will be billed separately even if deployed on the same instance.